Search Last.fm database for an artist and retrieve a list of suggested artists. 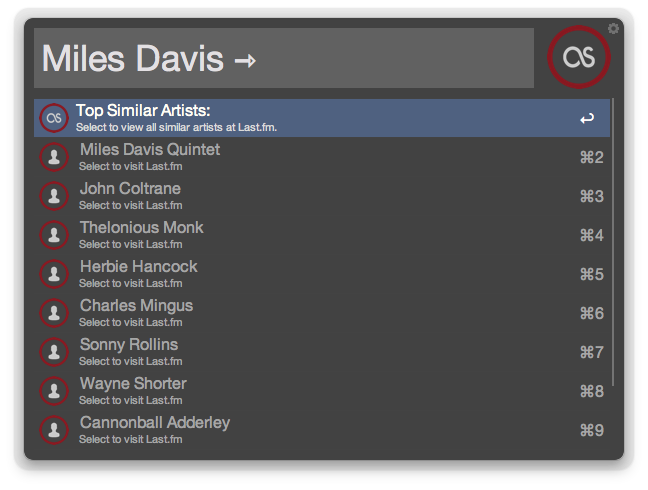 Selecting the similar artist from Alfred's list takes you to the Last.fm page for more info. "LS" or Hotkey triggers the workflow. Initially populates with a search for the currently playing track in iTunes, if one is playing. As you type an artist name, the workflow searches Last.fm for your query and provides a list of possible matches. Selecting an artist form the list provides a new list of Last.fm's Similar Artists for the previously chosen one. Selecting an artist from the new list takes you to their Last.fm page.